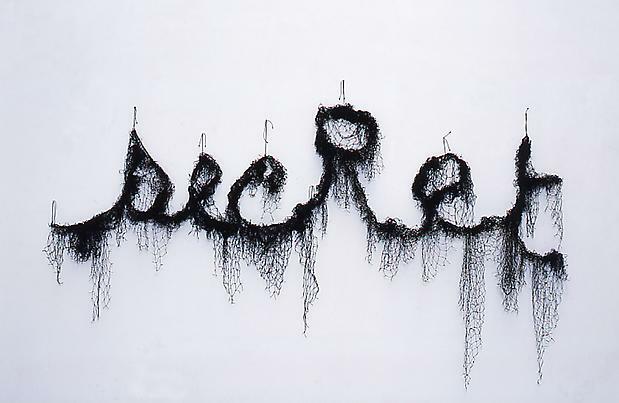 Marian Goodman Gallery is pleased to announce that we will open our fall season with an exhibition by Annette Messager. This will be the first solo presentation of Annette Messager in our New York space, and for the show she has created a series of new works. 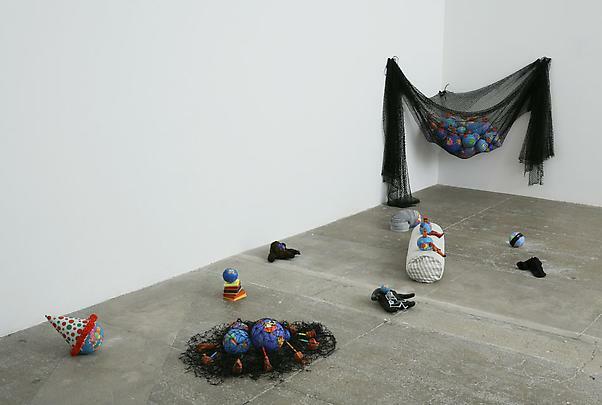 On view in the North Gallery will be an installation titled "Inflating, Deflating" ("Gonfles/-dégonflés"), 2005-2006, as well as a new series, "To Bring into the worlds" ("Mettre aux mondes"), 2006 which will consist of a dozen different works. 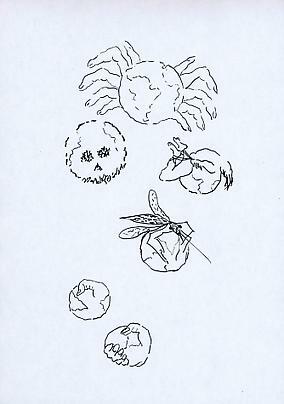 The latter responds to the piece "Inflating- Deflating", and will include eight new drawings. 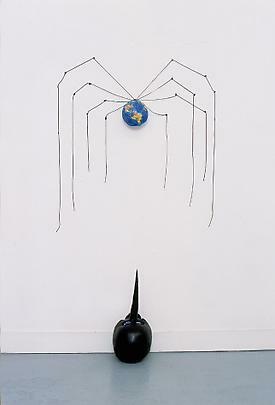 About "To Bring Into the Worlds", Annette Messager writes: "These are balls of solid earth painted to look like world globes, sometimes these worlds are trapped in nets, or appear to be invaded or attacked by little shapes, also made from earth, from which color pencils point, like toy ships, battleships and airplanes." 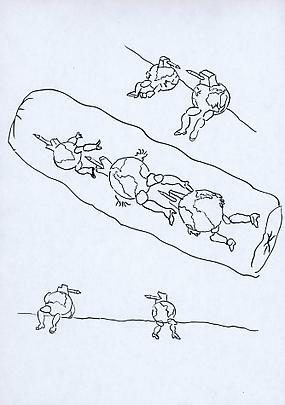 "At times the worlds become two characters placed on a bolster. Other worlds are buried and turn into the eyes of a long nosed skull (dead Pinocchio? ), develop into an animal, or get trapped in a sock (to be mended?) The series of eight new drawings starts with this theme of women 'bringing into the worlds'." "Our worlds are made of real or fantasy worlds, the world of ideas, socio-economic world, spiritual world, art world, everyday world; for instance my neighbor could be the person I see most often and at the same time be the most remote from my world. But in all these worlds there is only one human species, universal and unique." "Inflating- Deflating" consists of around thirty elements, mingled internal and external human body parts: arms, lungs, foot, stomach, organs, etc. all made of painted parachute fabric. Here our body is isolated in fragments, which mix and go through each other: the brain meets a breast, which is friends with a stomach, which in turns brushes against entrails. There is an interweaving of the inside and the outside, jungle of skin, organs, fluids, and immersed body parts. These voluntarily schematized elements breathe, inflate simultaneously, or together are like a landscape of breaths, panting, breaths of wind, which slowly deflate, expire…." This exhibition follows on Annette Messager's highly acclaimed installation last summer for the French Pavilion of the 51st International Venice Biennale, titled "Casino", which drew upon the legendary Italian literary work Pinocchio, and for which she was honored with the Golden Lion award for best national pavilion for France. About this installation Annette remarked in the catalogue, "Here we have a little puppet leading us by his nose. That puppet's our conscience." Often using reminiscence and memory as a vehicle for inspiration, Messager's wide range of hybrid forms has had an affinity with traditions as varied as the romantic, the grotesque, the absurd, the phantasmagoric. 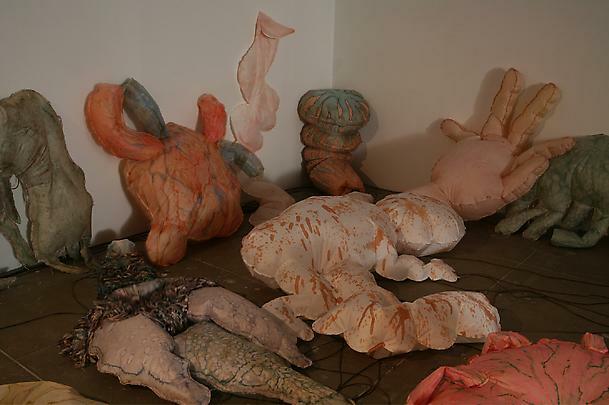 From early sequences of hand-made objects, to the "Collections" and then the "Albums" series; from installations based on the aesthetics of collage and accumulation to theatrical display environments; from giant bestiaries to dreamscapes of the feminine and the body; and from the domestic and fictional-autobiographical to the social, Messager's work has successively introduced new elements 'rummaged' from everyday materials and has often progressed into ongoing 'series' or resulted in dramatic incursions into space. 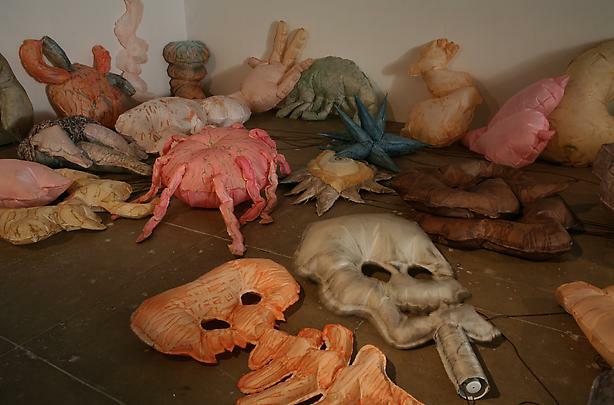 In the last decade, along with the pliant forms, dissected innards, flattened animal bodies, and soft toys that have been part of her artistic vocabulary has come a collapsing or 'deflating' of form. 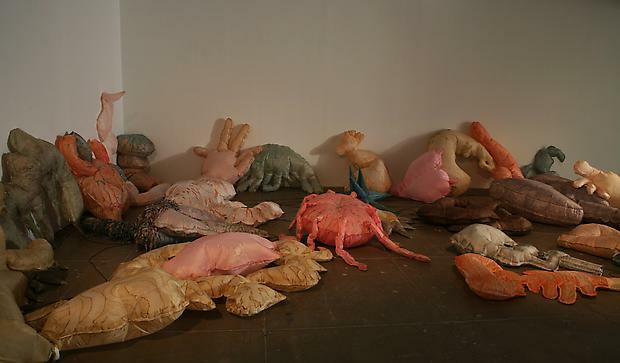 In recent installations the artist has taken new approaches to this 'deflation', giving 'breath', and life to her work. In the current exhibition, there is movement to the fragmented and organic bodies at play, and perhaps a wry meditation upon birth and creation. Annette Messager was born in 1943 in France where she lives and works. She attended the Ecole des Arts Decoratifs in Paris. Recent solo exhibitions included one-woman shows at: The National Museum of Contemporary Art, Oslo; Musee d'Art Moderne de la Ville de Paris/ ARC at Couvent des Cordelier, Paris (2004); Palazzo delle Papesse, Centro de arte contemporanea, Siena; Musee des Beaux Arts, Nantes (2002); Palacio de Velasquez, Museo Nacional Centro de Arte Reina Sofia, Madrid; Museo de Arte Moderno, Buenos Aires (1999); Musee des arts d'Afrique et d'Oceanie, Paris; Museum of Contemporary Art, Miami (1998); The Art Institute of Chicago; CAPC/ Musee d'Art contemporain, Bordeaux (1996); The Museum of Modern Art, New York; ARC Paris & the Los Angeles County Museum of Art (1995). A retrospective exhibition is planned to open in June 2007 at the Centre Georges Pompidou, Paris, which will travel to four venues, including Japan and England. A selection of recent group exhibitions this year (2005-2006) include: Naissances, Musee de l'Homme, Paris; Correspondence, Musee d'Orsay, Paris, La Force de l'art, Grand Palais, Paris, ART FAB, la Femme, l'Art, l'Europe, Espace Rendez-vous des lices, le Lavoir Vasserot et la Citadelle, St. Tropez; and The Eighth Square: Gender, Life and Desire in the Visual Arts since 1960, Museum Ludwig, Koln, Germany (all 2006), which will be on view through November. Earlier group exhibitions include: 'Yankee Remix" at MASS MoCA (2003); Venice Biennale (2003,1993, 1980, and 1975); Documenta 11 and 6 , Kassel (2002, 1977); Biennale de Lyon (2000 and 1993), and many others. 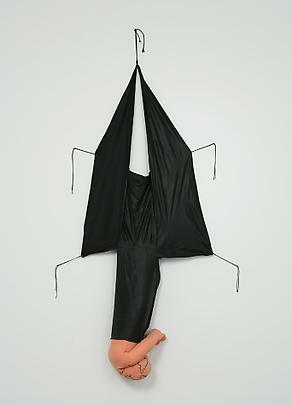 A new publication Annette Messager: Word for Word: Text, Writings and Interviews has been published by D.A.P./in assoc. w/Les Presses du Reel and Violette Editions will be available in October. Edited by Marie-Laure Bernadac, with interviews by Harald Szeemann, Robert Storr, Bernard Marcade, and Suzanne Page (416 pages, w/ over 300 illust. ), the book examines Messager's artworks and presents interviews and texts as well as previously unpublished notes and personal reflections on her work. Please join us at the opening on Thursday, September 7th from 6 – 8 pm.